District 6 Alder Marsha Rummel has announced she is formally asking Madison Metro to study the feasibility of moving the routes, although she said in a letter to the neighborhood that she has not decided whether she supports the idea. In considering the request, Metro will conduct a route-by-route comparison, review bus stop locations, consult with City Operations staff on the impacts of the change as well as gather input from residents through a public outreach campaign. Jenifer Street in June in the early stages of reconstruction. Project is now at peak apocalypse. Right now large swaths of Jenifer are just earthen piles as the City replaces the infrastructure that supports our modern comforts. In the run-up to this project, long discussions in the neighborhood debated the look and feel of Jenifer Street. Neighbors fought hard for as many traffic calming changes to the street reconstruction that mostly were ignored due to the need for Madison Metro to maintain their break-neck schedules. After all the input was considered, the City of Madison Streets Division decided to narrow the street two feet, and install some traffic bump-outs, but not much more. “During the MNA planning process, many neighbors on Jenifer complained about the speed of buses and traffic speed in general. 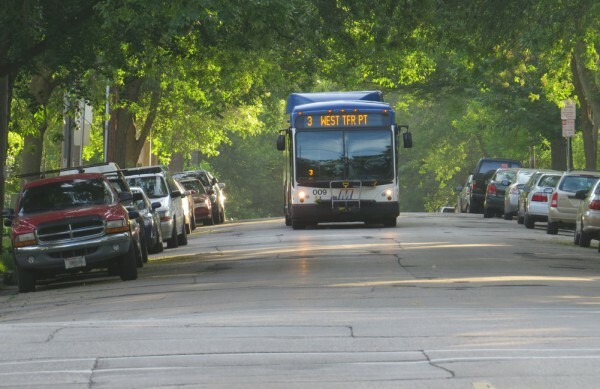 In addition, neighbors adjacent to the timed stop at Ingersoll have shared concerns about buses blocking access to their driveways and reducing the visibility of vehicles and bicyclists which creates a dangerous condition when exiting their driveways,” Rummel wrote. Most would agree that bicycles on Jenifer are almost on par with cars as the largest user of the now less-than tree-line residential conduit between Willy and Baldwin Street. But the narrowing will force buses, cars and bicycles to share the new road which just means the likelihood of accidents will increase. Surely the rate of honks and raised middle fingers will skyrocket. If the plan is approved, Metro proposes two permanent changes. The Paterson stop would be at the vantage point of this photo with the next stop at the Jenifer Street stop light one and a half blocks away. The request to study the issue will be formally introduced at the Madison Transit and Parking Comission (TPC) meeting Wednesday, July 13 at 5 p.m. in room 201 of the City-County Building. The current tentative schedule for this issue will include an administrative step at the August meeting, a public hearing in mid-September and a final decision in October. 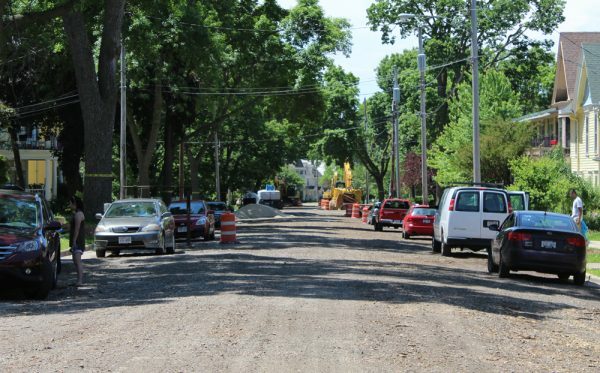 While the moving of the routes to Willy would possibly return more tranquility to a residential street, its questionable that Williamson can handle one more of anything now that every block is undergoing changes. It’s true the bus routes would deliver more people to the places that they would most likely want to visit first in the neighborhood. However, parking for both businesses and the people who still live on the street is still a full-on daily scrum. Taking away precious curb space could exacerbate a problem that is already discussed endlessly with each new proposed housing project, restaurant, bar etc. This entry was posted in Madison, Madison Commentary, Willy Street and tagged Jenifer Reconstruction, Madison Metro, Marsha Rummel, Willy STreet by TheEastSider. Bookmark the permalink. If the city converts abandoned bus stops on Jenifer back to parking then there shouldn’t be a net loss of parking spaces… This is a good idea. The issue is not loss of a specific number of parking spaces. The issue (among many others), is the loss of a “buffer” between automobile traffic and pedestrians which parked cars provide. This safety buffer makes people feel safe, and even allows businesses to have sidewalk seating. Without this “parking buffer,” there can be no sidewalk seating. The road widens, traffic picks up speed, and walkability disappears, along with the character of Willy Street, something we all share. Also, people don’t stop at businesses if they have to park a block away. They stop, when they can park right in front of that business. I am in favor of moving the buses to Willy Street instead of Jenifer; one plus is that businesses on Williamson will perhaps get free publicity as bus riders see their businesses and may not have known they are there. Of course, that is only if we can SEE out of the bus and it does not have advertising on it that clouds the windows. Another problem on Williamson that has not been addressed or even mentioned, are all the cars going through red lights. It happens more often than you think and you have to look both ways now, no matter if you have a walk light. It’s wonderful isn’t it, allowing people to run wild on Willy Street. No police in sight. The Businesses on Willy Street do not want the bus stops moved to Willy Street for many reasons. They have been freaking out ever since the idea was made public. These days, when riding the bus, I often see the eyes of a fello rider or 2 rise from their phones to see what’s on Willy St. Anyone else notice this? Having lived on Jenifer, on a bus stop, I would say that it would be nice for the residents to move them to Willy St. It would ‘quiet’ the neighborhood and keep buses on what is already a naturally busy and ‘louder’ street. Plus as a biker, I would love not to share Jenifer with buses, which can be a bit nerve-wracking. So you think the people on Willy Street won’t mind the loud buses as much as the people on Jenifer Street? So you think the bicyclists on Willy Street won’t mind the buses as much as the bicyclists on Jenifer Street? I want the buses back on Jenifer St. Williamson St. is already too congested, and there is a loss of parking for businesses. One big benefit of bus routes is that they’re plowed first in the winter. Good idea. I never realized trolley cars were on Jenifer years ago. It shows how bus routes get locked in even though the tracks and wires are long gone. One minor point. The driver change point is at Ingersol. Depending on whether the bus is early (it usually is) or the replacement driver is late (sometimes) the number four can be idling there for several minutes. If two buses are there at the same time it’s going to chew up a lot of curb space. Jenifer Street has been the neighborhoods designated transit street for over a hundred years (since trolley cars) and should stay that way. It’s the reason the Willy Street neighborhood (our neighborhood and yours) has the character it does. The lack of buses on Willy Street makes for pleasant walking, pleasant shopping, and pleasant eating on the sidewalks for EVERYONE. Notice that Jamerica doesn’t have sidewalk seating right now? It’s because there is no “parking buffer” between the sidewalk and the racing buses & cars since the temporary route changes were implemented (to help Jenifer Street with their street renovations). Change the bus routes, and change the entire neighborhood for the worse in countless ways. All this change would do is please a few loud/organized people on Jenifer St, and lower quality of life for EVERYONE else, EVERYWHERE else. It seems quite selfish to me actually. If you bought your house on Jenifer Street “with transit,” you should live in, and eventually sell your house “with transit.” Why a free gift for a few Jenifer Street whiners, at the expense of EVERYONE ELSE in the city? If this goes ahead, it will permanently, severely damage (if not totally ruin) Willy Street, which is in fact, the heart of our neighborhood. It will hurt nobody to keep things the way they have always been. It will hurt EVERYONE (including those on Jenifer Street) if the buses are re-routed to Willy Street permanently. 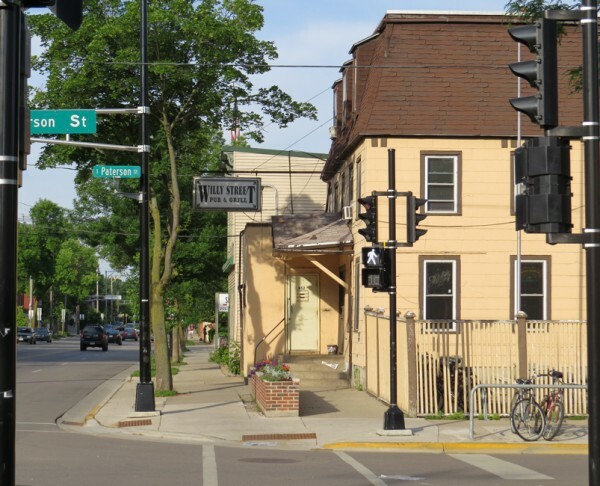 It will hurt all who visit Willy Street and love it for what it is. It will hurt all the business owners, all their employees, all the neighbors who frequent those businesses, all the people who live on Willy Street, and it will hurt all the landlords on Willy Street. Think deeper on the effects this change would have, please. It goes far beyond the convenient “disappearance” of buses on Jenifer Street. Thousands of lives, decisions, property values, rents, business plans, and on and on have been built around what exists and works now. Messing with the healthy organs of the city in this way, for the convenience of the very few, is a huge mistake, and it cannot be undone.